Dust control is Job No. 1 in this closet: Most of the shoes and handbags stay behind glass doors. The island boosts storage and offers a flat surface that’s great for packing a suitcase, says Nadine Holtz of Closets by Design of Northern New Jersey. The chandelier above the island enhances the luxurious ambience. 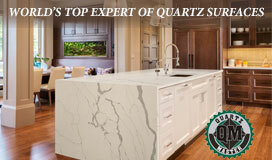 Courtesy of Closets by Design of Northern New Jersey. A functional key to closet design is being able to easily see and access items, says Angel Martin of Affordable Closets Plus. In this closet, for example, shoes and sweaters are easy to locate and grab; stacks of sweaters stay dust-free behind doors, while a long-hang section accommodates dresses. If a closet is large enough for an island, it’s a great functional addition by virtue of storage and, here, a seat for putting on and taking off shoes. In this example by California Closet Co., a push in the middle of the swirly-pattern drawers opens them (no knobs or handles for a clean look). Handbags are stored near the ceiling; the shelves immediately below play host to folded sweaters and T-shirts and hats. ©2016 California Closet Co. Inc. All rights reserved. Striking twin mirrored armoires maintain a tidy look in this closet by Affordable Closets Plus. The far armoire has top and bottom rods for hanging shirts. Adjust shelf positions as needed to fit your changing volumes of sweaters, workout gear, boots and handbags; custom closets such as this one by Closets by Design of Northern New Jersey take into account how many long- and short-hanging clothes you have. Courtesy of Closets by Design of Northern New Jersey. Even in today’s business-casual world, most men own some ties for dressier occasions. 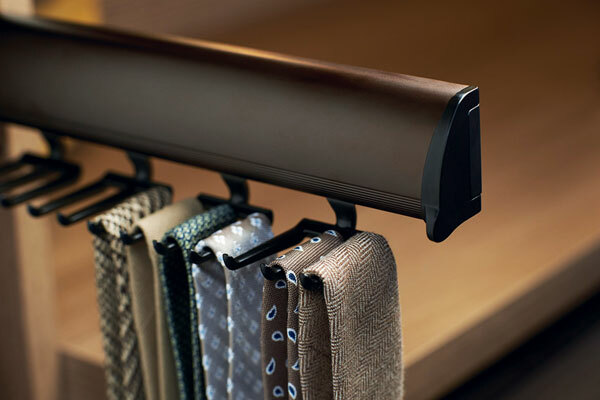 A pullout tie rack like this one from California Closet Co. keeps them wrinkle-free and at the ready. ©2016 California Closet Co. Inc. All rights reserved. 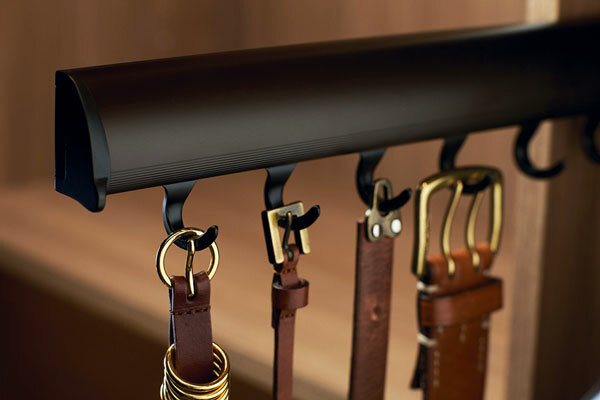 A slide-out rack from California Closet Co. organizes belts and takes up very little space. ©2016 California Closet Co. Inc. All rights reserved. 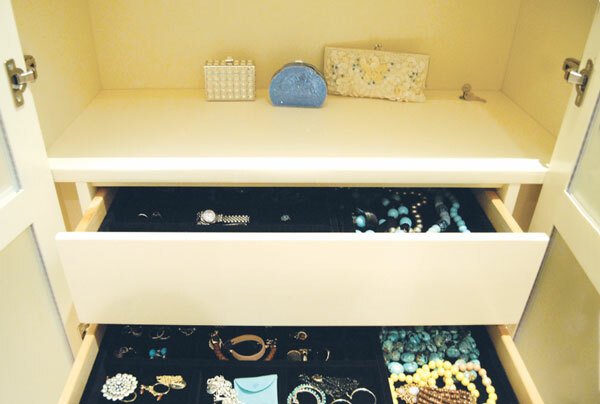 Velvety drawer inserts by Affordable Closets Plus keep various pieces of jewelry organized and untangled. Courtesy of Affordable Closets Plus LLC. Boot shapers extend the life of tall footwear; these by Affordable Closets Plus hang off rods inside a cabinet. Courtesy of Affordable Closets Plus LLC. Lessons in delivering the best possible function―just for you. A well-designed closet—with attractive, carefully planned rods, cubbies, shelves, drawers and more—maxes out personalized, easy-access storage in the space. To achieve closet nirvana, follow these 10 best practices from Nadine Holtz of Closets by Design of Northern New Jersey in Carlstadt, Shellie Topper of California Closets North Jersey in Fairfield and Angel Martin of Affordable Closets Plus in Bangor, Pennsylvania. Every situation requires unique treatment. All closets differ in terms of the varying amounts and sizes of clothing and accessories they hold and the dimensions of the space. The closet should suit personal needs, whether that’s extra boot and hat storage or only rods because you hang everything, even your T-shirts. So, for instance, don’t become wedded to a stack of drawers if you keep your lingerie, workout gear, socks, scarves and jewelry in your bedroom furniture, Martin advises. When you are building from scratch or reconfiguring a closet in a remodeling project, gather expert advice during the planning stage. This can ensure you choose the best functioning door (pocket, swinging, barn-style) and lighting as well as minimize ductwork that could derail function, Martin says. Topper describes advantages in the proper placement of electric outlets or tweaking the position of a door to assure optimum function. Perhaps surprisingly, hanger choice is a big factor in function and aesthetics. “Slim velvet hangers save space,” Holtz says. Martin can fit about 45 blouses or shirts on a 36-inch length of rod when using the velvet hangers. If you loop slacks through a hanger, use one with a short neck, Topper advises. This will maximize your space when you have one rod above another. And a closet always seems less messy if all of the hangers are the same type and color. Sweaters scream for special storage because they stretch and deform at the shoulders when hung. You might choose shelves or drawers (less dust) to accommodate your collection, and Holtz says sweaters can be folded and laid over hangers as an alternative. Martin praises the method of organization expert-author Marie Kondo, who tightly folds sweaters and hoodies so they can stand—arrayed like files, with the top edges always visible—in a drawer or on a shelf; find her YouTube instruction video at https://goo.gl/iKgVFc. Tailor storage for shoes and handbags. Slanted shelves provide ideal display but take up more space than straight shelves. The rule of thumb on shoe-shelf width, Martin says, is that 24-inch-wide shelves can accommodate three pairs of women’s shoes and 30-inch-wide shelves can accommodate three pairs of men’s shoes. Cubbies work well for flats but aren’t so great for heels, she adds. Holtz says many of her clients take photos of their shoes, which are stowed in Lucite boxes to stay dust-free; the photo is pasted on the outer edge of the box so finding a certain pair is super-easy. To thwart dust on handbags, save the pouches they’re sold in, says Holtz, who typically creates cubbies for handbags. Choose full-extension, soft-close drawers, which often come standard in today’s closet systems. “They let you see and get to everything that’s in the drawer,” Topper points out. As a bonus, when half of a couple gets up earlier than his or her other half, soft-close drawers don’t wake the sleeping partner. Consider accessories that suit your lifestyle and wardrobe. This might be a charging stand; hampers for laundry and/or dry cleaning; a mini-fridge; a drawer configured for jewelry; a pullout tie or belt rack; a telescoping valet rod; a pop-up or fold down ironing board; drawers with false bottoms for valuables; lingerie, scarf or sock drawer dividers; and more. “When the drawer is 30 inches or wider, I recommend a divider to keep things neat,” Martin says. A full-length mirror is handy near or in your closet, especially one that’s also used as a dressing area. The back of a swinging door is one option. Martin also suggests that if you have tall cabinetry in the closet, mirrored doors will do double-duty beautifully. Get real. Your 8-by-8-foot closet might seem generous when it’s empty, but once you add rods, your island dreams won’t work. (An island’s counter space is great for packing suitcases, the drawers are a storage bonus and a connected bench is great for taking off and putting on shoes though!) Martin has a smart compromise, suggesting a countertop on a perimeter drawer stack and placing an ottoman, perhaps with storage under its top, in place of an island. 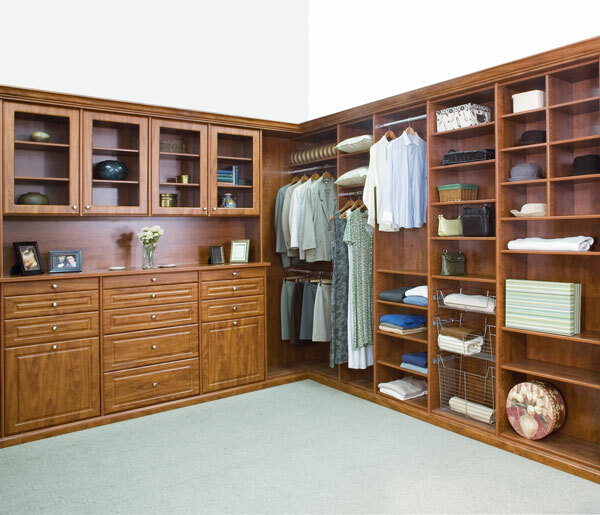 Our experts say clients often overestimate what will fit in the space, which could be a good reason to ask for assistance in major closets. Mary Vinnedge has added wire shelving and drawer systems plus a shoe bag to stretch closet storage in her home. She loves the matching white hangers in her master bedroom closet.